This essential oil mixture is based on a study conducted to test the efficacy of peppermint essential oil for hair growth. The study results showed remarkable improvements in terms of stimulating hair regrowth and follicle thickness in mice. Read our detailed review about peppermint oil for hair growth for more information. 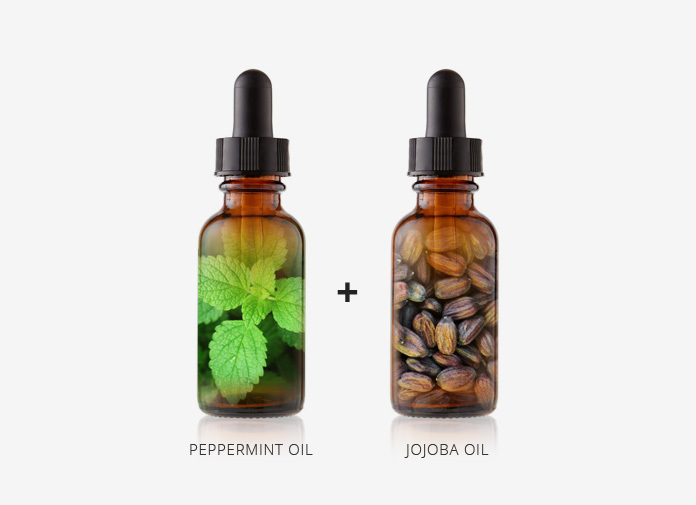 In other words, mix 9 drops of peppermint essential oil and 2 teaspoon of jojoba oil together. Use the same ratio if you want to increase the amount. For instance, for 27 drops of peppermint oil, 6 teaspoon of jojoba oil is required. Apply the mixture for 6 days a week for 4 weeks to see results. Note: The study doesn’t give out any detail on their mixture ratio. The recipe listed here uses a general guideline from the essential oil dilution chart. The study also doesn’t mention how long you should leave the topical treatment applied to the scalp, so we added the steps with the asterisks (*). These steps are taken from another research study which was used for testing the effects of stimulating hair growth using an aromatherapy oil mixture. How to Use Peppermint Oil for Hair Growth – Visible Results in JUST 2 WEEKS!